NASA's Cassini spacecraft has completed the first of 22 dives through the 1,200-mile (1,900 km) gap between Saturn's atmosphere and its innermost rings. Sept. 15, it will finally plunge down into the gas giant's atmosphere for one last set of measurements. NASA's Cassini spacecraft has gone where no craft has ventured before: diving through the narrow gap between Saturn and its icy rings for the first of 22 planned plunges before it dives into Saturn's atmosphere Sept. 15. Space.com talked with Joan Stupik, a guidance and control engineer for Cassini at NASA's Jet Propulsion Laboratory, about the risks of that first pass between the planet and rings and what scientists hope to learn over the course of its unprecedented journey. You can view a video of the conversation here. "The ring scientists have spent a long time, more than a decade, characterizing those rings, but that small gap between the inside of the innermost ring and the top of the atmosphere where the ring ends isn't known fully," Stupik told Space.com. "We think that it's clear of debris, but there's a small possibility that there could be small bits of debris particles, flecks of dust in there … going up to 45 times the speed of a bullet." In fact, Cassini will use that same maneuver when necessary as it explores different parts of the gap over the next 21 dives, Stupik said. "The risk to the spacecraft varies based on where we're crossing that gap," she said. "We have plans in place; if the area is more thick with debris than we expect, then the engineers are ready to make last-minute changes to how we go through the ring … [to] use the antenna as a shield just for that little time that we're crossing through the rings," she said. Whenever the coast is clear, though, scientists will be free to orient Cassini to gather as much data as possible about the planet and rings from their new perspective. "This is the first time we're going to be able to look at the rings and Saturn separately," Stupik said. 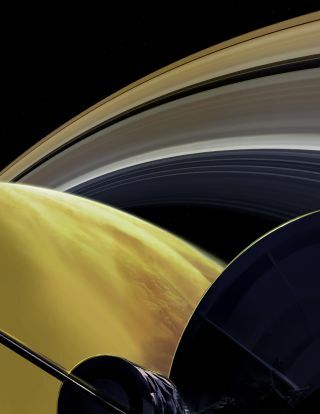 "We'll be able to learn how old the rings are, and that will tell us a lot of information about how they were formed, and also to learn about what the interior of Saturn looks like; how big is the core, what is the inside made of, how does the magnetic field work." By the way, she added, whether or not Cassini meets with misfortune along the way, like an unexpected piece of debris, it's still gravitationally set for its final plunge into the planet's atmosphere Sept. 15. The only question is whether scientists are able to catalog its journey. Cassini's final dive was one of two potential endings for its 13-year exploration of Saturn's system — both were intended to protect the planet's moons from contamination that could distort our future searches for the building blocks of life. "Because we're almost out of gas, and we have no way of refilling — the nearest gas station's a billion miles away back on Earth — our choices were either to throw it out really far away from Saturn so it would never crash, or to dispose of the spacecraft inside of Saturn," Stupik added. The scientists and engineers of the Cassini mission chose the second option — to learn as much about the planet as possible in one final, epic dive, collecting data about the planet's mysteries, which scientists will be analyzing for years to come.